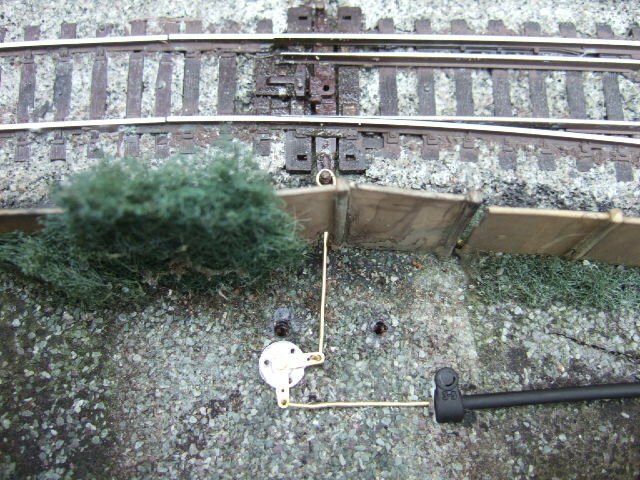 I bought manual turnouts, err points, for my layout. They came with the old hard plastic switch motors that had no electrics inside, but still can be used to operate the points. I left the dummy point motors on the layout to see what would happen. It did not take long for them to literally warp and bend from the heat. If those Pecos are made of the harder plastic. I would just leave one sitting on the layout for a month or so and see what the sun does to it. ...If those Pecos are made of the harder plastic. I would just leave one sitting on the layout for a month or so and see what the sun does to it. Yes, this is my intention. I already have ordered one to test. As I already mentioned here on my introduction, I'm going to build my railway at waist hight, due to my bad back. At the moment everything sits in a planning stage. A lot of thinks are new to me, and I've to work my way into this matter. Although I've quite some DC rolling stock, I bought them over time because I liked those models, and put them on display. 80% of my locomotives are AC Märklin, with that I'm very familiar with, but in turns of electrics is totally different. An other thing that's new to me will be DCC. I think it's logical to go for this system, if you start a new layout. As for track building, I've no plans of putting scenery around the track, the scenery must come from the garden around it. I can get my hands on EPDM rubber foil, a product they use for roofing. It's actually the left over that they normally through away, and comes for free. Most of the time are these strips of +/-40cm wide and up to 10 m long. 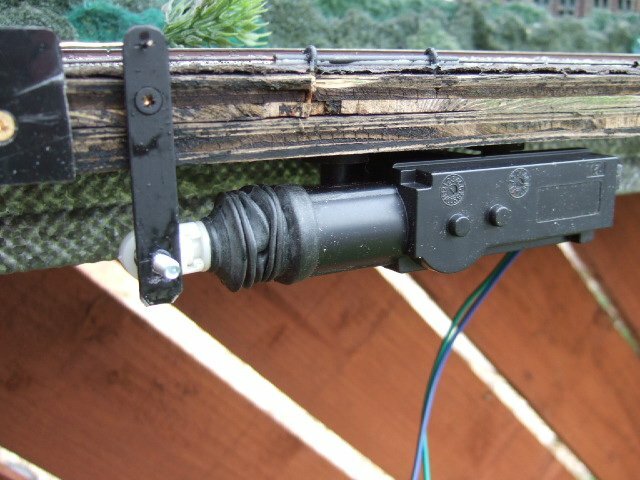 This material is wel suited to put under the track, as wel to make a cover over the track when not in use. It can be vulcanized with glue making it one solid piece. Other advantages are that it absorbs noise, good for all weather, absorbs no water and is elastic and adept it self to temperature. If my plan works these Peco points are well suited for my needs. The DCC control is not a problem. I've just checked the manual for one of my Decoders, the Digitraxs DC52, and it is designed to work 2 wire solenoids. 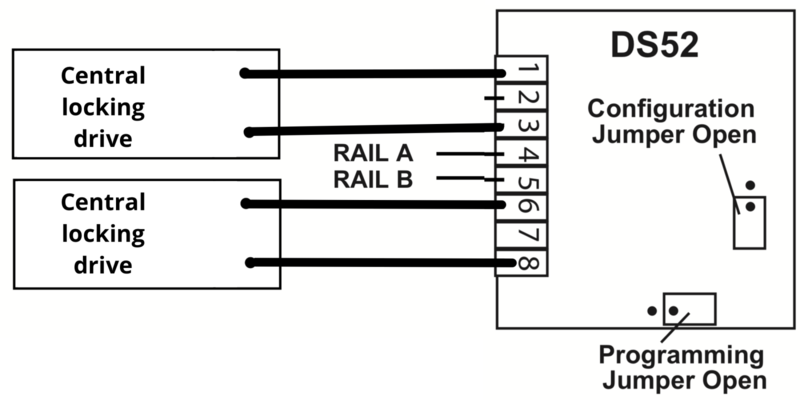 An Accy Decoder output has three terminals: Left, Centre and Right; these would normally correspond to Thrown, Common and Closed on a three wire point motor. 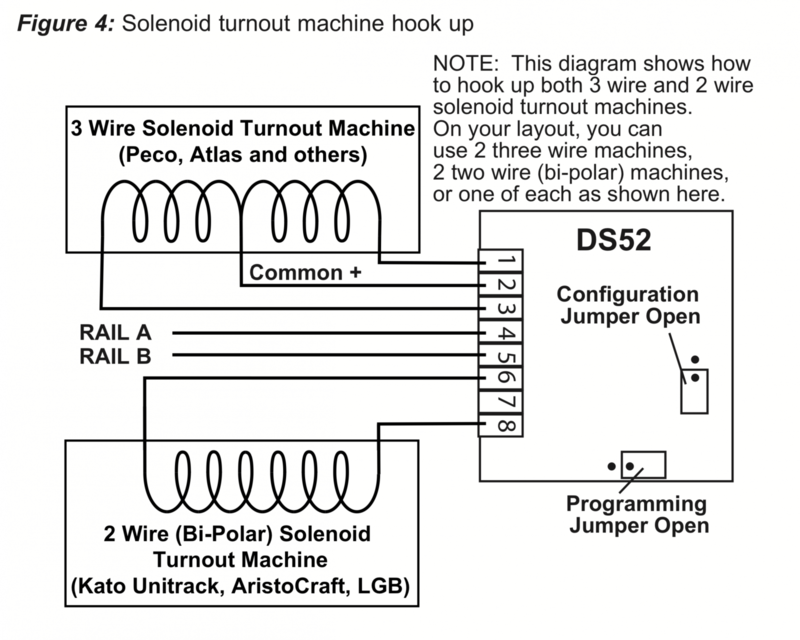 To control a two wire solenoid you connect it to the Left and Right terminals and ignore the centre one. Simple. Is that the same with every other Accy Decoder? It is possible you meant Digitrax DS52? Because I can't find a Digitrax Dc52? Yes I did mean the DS52. They are my decoder of choice these days. They are powered off the DCC bus, with built in CDU. They are easy to program. They can driver two motors off one output. They work with a long cable run. I can install them outside with only crude protection from the weather. If one fails (and that hasn't happened yet) they are simple to replace. They are also cheap here in Germany. I think I will follow your recommandation. Can you or someone else sketch me again, how exactly do I connect the central locking drive to the DS 52? I just do not want to do anything wrong. And if someone has an idea where to buy a Digitrax DS52 that would be helpful, because I only found seller in the US. A seller in the UK or EU would be very good. Wiring up is very easy. Heres an image form the DS 52 manual which shows the way to do it. Its the lower, 2 wire motor that you need to copy. Basically you don't use the common outputs (2 and 7). Sorry I can't help with a UK supplier. For the last few years I've bought them when even I've seen them an a stall at an exhibition, so I've always had a spare or two when came to install a new point. Although I've now run out so I'm looking for one or two for myself. Thank you guys for your help and advices! Have now found a store in Germany that would sell me Digitrax DS52, but the prices in England are simply cheaper. In Germany I would have paid 28 € for the piece. Have also bought at hattons.uk points from Peco for 12.50 pounds the piece, which would have cost here at my dealer in Germany € 26.50. The pound currently at 1.15 euros. Since I have needed several points, the shipping costs are no longer significant. I did some experimenting with the servo yesterday and the results are very promising. I've got it operating two sets of points simultaneously, via a couple of bell cranks with an old Tri-Ang controller set at half speed. You could also use a 6v lantern battery. As you can see the servo is mounted under my baseboard although it would be easy to surface mount too. £1.85 (April 2013) for a powerful, water resistant point motor has got to be a bargain! They are rather large but would be quite easy to disguise with buildings and/or scenery. Two wire operation too. The project isn't finished yet and I'll post more details and pictures when it is. Can you tell me where you got the bell crank and related material from? I do not find such a thing in Germany and have found that the British dealers are much cheaper and deliver faster (!!) than the traders from the continent. (Hattons has delivered my rails I ordered Friday on Tuesday. Hi Thomas. These cranks are most commonly used in Radio Controlled models, most often in aeroplanes. That is the sort of shop you need to look for. Sorry for butting into Ian's post. Any help and any hint is good. Thank you for your tip, then I'll look for such a shop. I have now shown some hobby colleagues the picture and now knows what bell crank etc. in German means. What Google Translator offered as translations was not effective. Because it is also my goal to let one central locking drive make the switching of to points with such a linkage.